be added to every order. An environmentally friendly way to write! Have you ever thought about what goes into making a pencil? First of all, a tree needs to be cut down in order to supply the wood. Then, graphite needs to be inserted inside the pencil so you can write. When it’s all said and done, what you end up with is a standard, ordinary pencil that isn’t actually eco-friendly.And that process is only for one pencil. Now, multiply that by 14 billion, and that’s how many environmentally unfriendly pencils are produced and discarded each and every year. That’s quite a toll on forests, eco-systems and landfills. We’re all told to think globally and act locally. There isn’t more of a local act than using an eco-friendly writing utensil. Great for all uses, including writing, drawing, drafting and sketching, Greenciles® takes paper out of the landfills or recycling plants and puts them back into your hands – as a high-quality 2HB pencil! If you’re looking to go green at home or the office, then start with the pencils you’re using. Order your 10-pack of Greenciles® today and write like you’ve never written before! 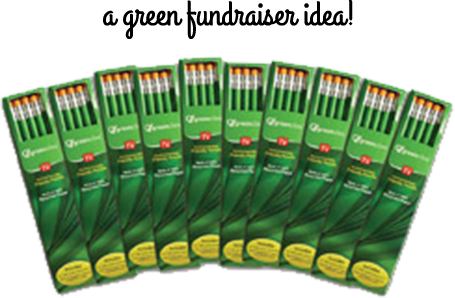 Just like regular pencils – only greener! 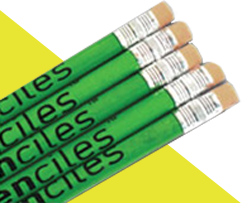 When you order your 10-pack of Greenciles®, you won’t believe how much they look, feel and handle like conventional 2HB pencils. Each Greencile® features a synthetic rubber tip, which makes it easy to erase your mistakes. Additionally, when you have to sharpen Greenciles®, instead of throwing out the pencil shreds, you can recycle them again!